Hayes Gaze and Cannon Fodder: B1G Champs! Congratulations Buckeye Nation! Our Men of the Scarlet and Gray are your 2018 Big Ten Champions! At the start of the season, most of the nation expected Ohio State to be standing victorious in Indy, and they did just that. Sure, there were things that were maddening this season: the inconsistent play from the defense, the mind-numbing times the offensive staff would ruin drives with questionable play calls, and the lack of a rushing attack for most of the season. However, there were bright spots all over the field and schedule. How many really expected the season Dwayne Haskins had? If you raised your hand, you’re lying to us all. How great was it seeing Brendon White, once given a chance, having an impact? And to get the game ball to give to his father, former Buckeye DB William White, as he battles ALS? Awesome moment. The debate over this team being worthy of a playoff spot will rage on for years. They have one of the hottest offenses in the country. The defense could be a wall and a sieve in the same game. But one thing is for sure, going 12-1, beating the snot out of TTUN, and making a New Year Day trip to The Rose Bowl Game as Big Ten Champs makes for a great season! Before I get into this week’s Haze Gaze and Cannon Fodder, thank you all for reading this season, for your comments and questions, and for being a part of The Best Damn Fans In The Land! There is a new shiny, silver-ish football to display inside the Woody this week. That in and of itself is something to be proud of. But this week, the Hayes Gaze sends its loving gaze on the awe-inspiring game that one Mr. Dwayne Haskins had on Saturday. Just how talented is Haskins? We have forgotten to watch the stat book when he plays. The old norm in Columbus was to see a 300-yard passing game and celebrate. This season, we would have not celebrated his performance just four times. Haskins topped the 300-yard mark nine times, and went over 400-yards five times! Saturday, his 34-41 for 499 smashed the Ohio State and Big Ten Championship Game records. Let that sink in, Haskins completed 83% of his passes, and ended the night one yard short of 500 yards! Add in the five touchdowns, and it becomes obvious why he was not only the MVP, but getting a ticket to the Downtown Athletic Club’s little meeting in a couple weeks. Sure, Haskins wasn’t perfect, but he was close enough for me. Congratulations Haskins, and if that was the last time we see you face Big Ten competition, thank you for this year! 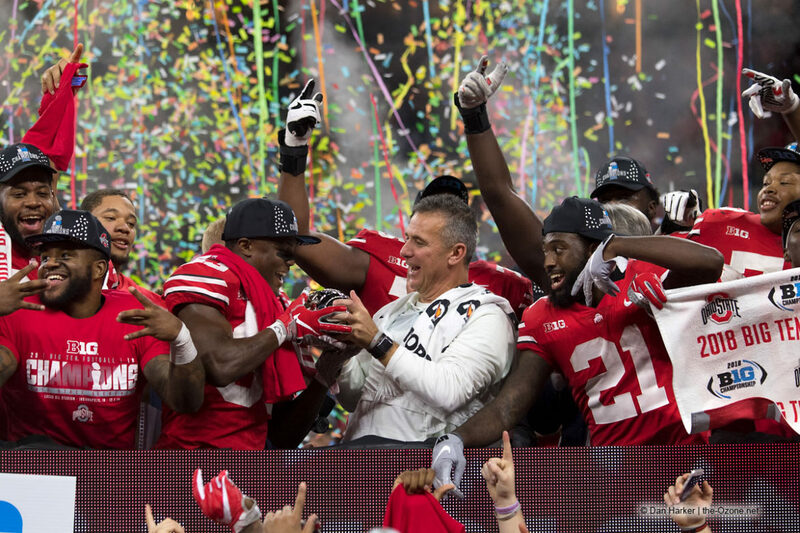 Were the Buckeyes perfect in Indianapolis? Of course not. There were problems all over the field. The play calling dumbfounded many of us at times. The turnovers from the offense, and failure to capitalize on Northwestern turnovers was maddening. Giving up yet another 75+ yard touchdown made me want to throw things. But the worst performance Saturday by a Buckeye? It wasn’t in Indy. It was at the Gaylord Texas hotel in Grapevine, Texas. This week’s Cannon Fodder takes aim directly at Ohio State AD Gene Smith, a member of the 2018 College Football Playoff Committee. I don’t know if Ohio State is a Playoff team or not, because no one knows what actually makes a team worthy. I know Ohio State will not be participating in the Playoffs this season, and that falls as much on Gene Smith as it does the team for losing at Purdue. The committee is made up of 13 members, from all the Power 5 conferences, former coaches, media, etc. And each member has to recuse themselves from discussing teams they are associated with. Smith is supposed to not politic for Ohio State due to these rules. However, even though none of us were in that hotel, I know there is more that Smith could have done to emphasize how good this team is playing right now. Gathering stats, presenting metric data, something. He could have campaigned against the other teams (Looking directly at you, UGA and Notre Dame). It has been a fantastic season for the Buckeyes. But there is certainly a level of deserved disappointment. And it feels like to me, at least some of that blame lays at the feet of the AD. There is a whole month between now and the next time this team takes the field. Washington, winners of the Pac 12, will bring a solid and well-built team to The Granddaddy of Them All. There will be questions and decisions to be made by players who are going to move on to Sunday football. That will change the outlook of the Rose Bowl. 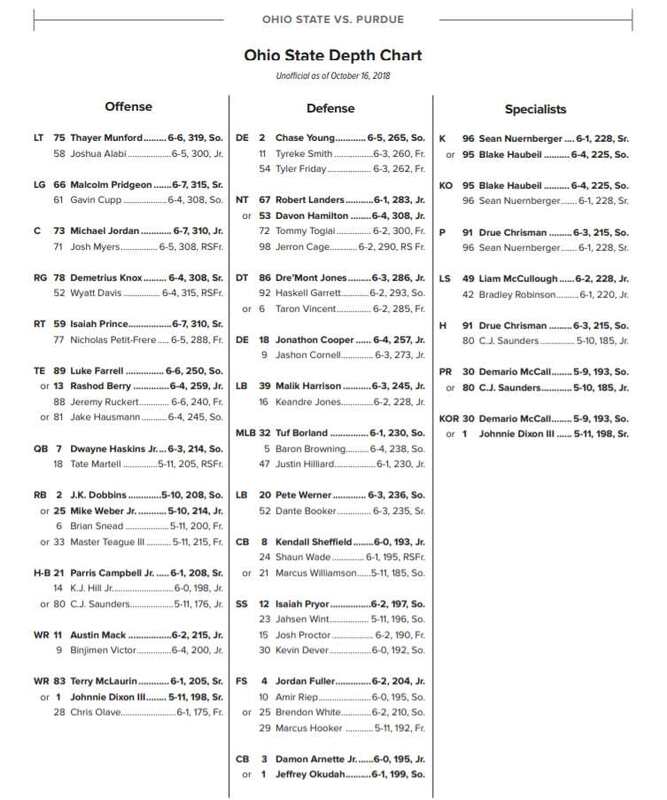 Add in that Urban Meyer will finally get to have his “fall camp” time with this team, and it is impossible to guess what this team looks like January 1st. However, based on what we have seen in 2018, I see another Rose Bowl Trophy being added to the case in the WHAC. A super way-too-early prediction? Ohio State 31, Washington 24. Notre Dame. No conference championship. Weak schedule. Don’t deserve to be in top 4. They can only play the teams on their schedule. All they did was beat everyone they played. Not sure what else anyone would have wanted. Not an Irish fan by any means, but they deserved it IMO. If you are blown out by an unranked team, you are unlikely to make the “final four”. Ohio State has been blown out twice. Oklahoma has not. Yes, there is SEC bias and ranking 2-loss Georgia ahead of the Buckeyes is unfair, but IT JUST DOESN’T MATTER. but beating Purdue would have changed our season. It’s a team game, so no one person or one side of the team deserves blame. But if average teams play with you on a given day, Neb. Mary. Tcu, those games stick in the memory as much as the good victories. But a blowout to an average team, was not to be overcome, for the second year in a row. It is hard to believe Georgia landed in front of osu, that makes no sense, except for sec bias, which one would think that a national committee would eliminate. Still work to do on that. While I wanted tOSU to make the playoff almost as much as I want to breathe, I find it hard to criticize the selection of OK for the 4th spot. Of all the 1 loss teams they are the only team to avenge their one loss by beating the team they lost to. No other team can say that, and to me that was a huge deciding factor. Just my 2 cents. I agree to an extent. I think there is a solid argument for Oklahoma getting the 4th spot. What is a little more irksome to me is that Georgia sits at 5th and us at 6th. Does it matter? Not really–it doesn’t change anything. But…what the committee is saying is that even had Texas beat Oklahoma on Saturday, it would have been Georgia getting the 4th spot, not Ohio State. They have 2 losses and did not win a conference championship. One of those losses was by a lot of points. Yes, they played Bama well. But still, 2 losses and no conference championship?? Oh well, it is a mute point, but goes to show that the Buckeyes will not be given the benefit of the doubt until they prove themselves otherwise. OSU vs. Clemson and Alabama vs. MSU, both big ten teams scored a combined 0 points in these two semifinal games. The selection people remember these games. But they forgot about 2014? While I wanted tOSU to make the playoff almost as much as I want to breathe, I don’t see how there could be criticism putting OK in. They had 1 loss, but then turned around and avenged that loss. No other 1 loss team can say that. To me, that is a deciding factor. Just my 2 cents. The season would have been better if the Buckeyes had a defensive coordinator who knew what the hell he was doing. FIRE SCHIANO NOW!!! As the regular season has concluded, I now look back and see that the LB’s and DB’s were the biggest problem throughout our season. No improvement whatsoever, and that necessary doesn’t fall on the coaches, the players at those positions just don’t have the talent, plan and simple. Borland, Werner, Sheffield and Arnett are just not good players. Coaches tried other players but they didn’t jump to the forefront. Spot on but you’re being too critical. They are good players but not national championship caliber. GO BUCKS!